Income is the money in your paycheck. It’s what you make from your job. Wealth, in contrast, is everything else. It includes stocks and bonds, home equity, other properties, investments, your retirement funds etc. Importantly, you can inherit wealth directly, but you cannot inherit income directly (most of the time). This suggests that there is some meritocracy in the distribution of income, not so much in who owns yachts and has deep investment portfolios. From Zagorsky, Jay. 2007. Do you have to be smart to be rich? The impact of IQ on wealth, income and financial distress. Intelligence 35: 489-501. I think it's a bit dangerous to put up the graphs and leave them at that without any explanations. There is a lot of sociological stuff to unpack here. these graphs, i feel, fail to consider that there are a higher amount of people with lower IQs, thereby making the graph appear equally distributed in wealth. Re second chart, "This suggests that there is some meritocracy in the distribution of income" ... No, definitely not; this suggests instead wealthy families hanging on to their wealth and maintaining status quo despite having idiots in family. Who needs IQ when you have a national infrastructure watching out for interests of the wealthy. I'm just stunned by the idiocy of the notion of meritocracy at the core; go see Wikipedia's analysis of wealth inequality, to start with, and get a little smarter. I love this blog, but every now and then the blindness revealed here is stunning. This makes some sense, since wealth is much more inheritable than income. Although there is a genetic component to IQ, and even more so a heritable component that depends on how your parents raise you and what resources they have to foster your cognitive development, it's by no means a perfect correlation. High IQ parents can have children with severe learning and developmental disabilities, etc. So parents with above-average IQs and correspondingly higher incomes are providing their lower-IQ children with wealth that doesn't match their own income. Also, I find it interesting that the chart stops at 130, two standard deviations above the norm. 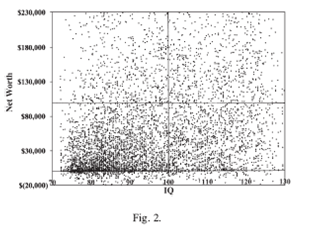 While it is difficult to measure IQ below 70, it is easily measured above 130, and in fact most "creative producers" - those people who make a significant and creative contribution to their field, such as scientists - have IQs above 130. Basically, there are entire job markets (like most of academia) that are not represented in the graph. Good old genetic regression to the mean. IQ is not related to meritocracy, but to beliefs about meritocracy. Okay, this post makes me angry. While there may be a correlation between IQ and income, that does not mean that there is any level of meritocracy in the distribution of income. Even if we somehow believed that "intelligence" is equal to "merit" (which I definitely will argue against), there are some really good reasons to challenge the idea that the IQ test measures intelligences (and quantifies, no less... as if that were possible). For starters, IQ is based in the ideology of biological determinism and, also, it's a RACIST test, for goodness sake! I recall hearing at one point that there is not a "causal correlation" between high school completion and income. The true correlation is between I.Q. and income. In other words, high school dropouts with an I.Q. of 120 earned as much money 10 years later as high school graduates (no further education beyond that) with an I.Q, of 120. The reason high school dropouts earned less was because, as a group, they had lower I.Q.s--not that they hadn't completed high school. Having HEARD this, I have never found a reliable, valid SOURCE for such a claim, although it does sound reasonable. Any thoughts or studies to cite? Without an age and education distribution of these charts the data is meaningless. Young people with an IQ of 130 and a living parent and only middle class or poor grandparents are highly likely to have no wealth in spite of their IQ, but when they are 40 most of them will have relatively high income, depending on their chosen profession. When their parents die they are likely to have increased wealth as well. People with very well off parents who are dead will likely be relatively wealthy and many of them will have reasonable incomes based on the wealth they hold, but those with low IQ's will have had low wealth and low income (unless employed in family businesses) when young. It's just not simple enough to get the whole story from these two charts. By themselves without info about age and education and 2 generations of family wealth they are virtually meaningless and probably misleading. Some of the apparent difference between wealth distribution and income distribution in the graphs flows from using the same dollar scales for both. Income ranges are narrower, so that graph bunches tighter than wealth which has a broader range. An income of more than $150,000 is pretty exceptional (probably more than 95% of people will never have that much income in any year of their entire life after adjusting for inflation); almost all homeowners (about 60% of people, at least, become homeowners and stay that way to an advance age) eventually have a net worth of more than $150,000 late in life, so the high end of the scale which is displayed for income is truncated from the data for wealth. Retirement savings for the middle class are also highly age related both due to contributions and investment earnings. Also wealth, even inherited wealth (which tends to be inherited in middle age or later) -- tends to be strongly age related which is a confound for IQ/wealth relationships. This is even more true because an important kind of wealth inherited or accumulated early in life (investments made in one's own education) doesn't appear on a balance sheet - it only appears in income as a derivative result of investments made in someone's income. Further, many people with inherited wealth don't hold it directly - it is in trusts for the benefit of their families and often not reported as part of their own net worth until the trusts are fully distributed late in life, if ever. Children of the wealthy look self-made on a balance sheet for most of their adult working lives. I might be wrong on this but it seems that the wealth graph, while it is indeed all over the map, does show a correlation. You can definitely see a cluster around 0 for people with IQs less than 100 which almost completely disappears for people with IQs greater than 100. Maybe you could actually do a regression and give confidence intervals? Your analysis is lacking. Just because we see a slight positive correlation from the graph doesn't mean that dude with a 80 IQ making 500,000 isn't incredibly influential to the regression. Please give up the data and the source. I think you are failing to realize what the data shows: that cognitive ability is generally necessary but by no means sufficient to earn higher income or accumulate wealth. For example, a PhD in phylosophy requires a lot in terms of intellect and hard work, but I've never heard of any phylosophy companies hiring. Wealth is not income x time + heritage. It's (income - spending=savings)x time+ heritage. The difference between the graphs could be explained by assuming that people with high IQ spend a higher share of their income than people with lower IQ. People with higher IQ more often strive for higher education and are therefore often don't start earning money until they are 23 or even older for PhDs, while people without college or even without highschool degree tend to start working as soon as they leave school. The costs for college are contained in the formula as "spending", which makes the assumption "higher IQ correlates with higher spending" more plausible. That isn't really true, CEO children generally grow up to go to their parents alma maters, and the crony system has each other's sons start at high or mid-level jobs with in each other's corporations- I've witnessed this first hand. Secondly. Nowadays, there is not much opportunity to gain an education unless you have a high income family behind you .most scholarships are skimpy and college fees so high, they are difficult to use. Thirdly, Unless you are a CEO, or board that can vote yourself high wages, or the very top one percent of any profession except technology and money management- now you will be underpaid. 77% of College instructors, PhD or not, are un-tenured and paid very little. this is also true of anyone involved in the arts, teaching, fabrication, and almost everyone else. Oh , And the government, workers are well paid, well-benefited and well-pensioned. Lastly, now there is no way to save- no interest is paid on money you do manage to scrape together as interest gobbles it up at the same time. So chance to improve one status diminishes over time. Also, look at the upper halves of both income and IQ. The trend disappears. I think that this is only telling us that there are not a lot of mentally handicapped engineers, but other than that it's a crapshoot. 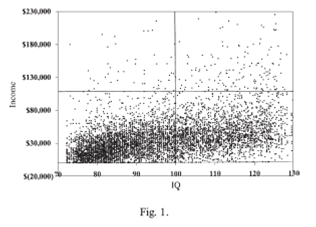 Why are the smartest people by IQ not always the richest and vice versa? Of course the rich would rather have intelligent slaves..we are more productive all else being equal. Unfortunately, we are also more of a threat to their status and most of us aren't allowed compensation that enables us to overcome the established rich with inferior intellects and talents. It's not all over the map. I see substantial clustering there. Do you need glasses? What happens if you run a trend line through the data? Your definitions for income and wealth are false, Lisa. 1. Wealth is property (right of ownership) at the moment of trade in purchases and sales. 3. Money does not exist. Money, were it to exist, would be coined mental by weight and fineness. Money, were it to exist, could exist absent bankers or government agents. Cash is bank credit circulating in perpetuity. Checking account credits, of course, are bank credits. I was given an IQ test in the mid 1990s by the University of Washington departments of psychology and genetics. They were tracing a bad spelling gene. I tested top 0.1% in applied math. There were no questions higher than softball freshman calculus. One of the questions had no right answer, so I figured out what mistake the test writer must have made. I am not top 0.1% applied math. Bad test. There is a huge difference in a top verbal person and a top math person. Single IQ number... bad indicator. I am top 2% income, due to saving and investing...not from being smarter. Try plotting % saved and invested vs % income. It is the ant and the grasshopper.